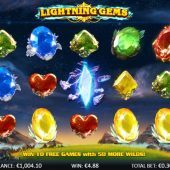 Lightning Gems slot is a fast paced but simple game that will appeal to fans of Play 'n Go's Gem Drop or Netent's Starburst. I think here though we are a class above those two games with spectacular transparent reels over a disturbed night sky laden with menace and a great 3D effect too. The animations are superb with plenty of thunder and whooshing lightning along with clean and original graphics, but will our money disappear in a flash - or not? We get stacked symbols on all five of the reels of three rows and 10 paying lines with which you can win both ways too, from left-to-right and right-to-left. You get stacked Golden Sundial Wilds on all reels and these will pay the highest 5-of-a-kind win at 500 coins, and we pay 15 coins per play so that is around 33x bet. You would get 133x bet for 5 scatters though, but back to the usual icons of which the next best is the Red Gem at 125 coins, the Yellow at 50 coins with the Blue or Green awarding 40 coins for a full line. The card values are depicted in suits with a coloured small gem and all pay 25 coins. Nextgen have built some great random in-play Wild activity into the game, the first of which is the random nudging Wild. A flash of lightning will make 1 to 5 Wilds appear when they have missed the bottom or top row by one position and will nudge them to fill either one, two or all three rows. You may see one nudge up twice with a second three times for example. A roll of thunder and lightning introduces us to between 1 and 5 Silver Sundials around the screen which will fill random positions, or reels or both. You may find you get nudges on one or more of them too so they become full reels of Golden Sundial Wilds. You can get both these features on the same spin so you never know what's going to happen! 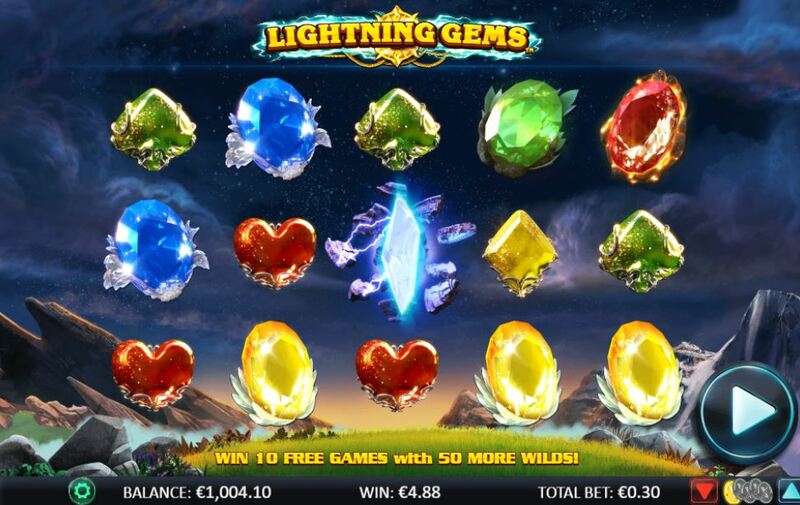 If you see 3 or more Lightning Gems in view after a spin, you will be awarded 10 free spins which can be retriggered indefinitely too. In a spectacular explosion of animation you will see a stack of 10 extra Wilds burned onto each reel before the spins begin. The second enhancement is that the above random in-play Wild features will occur on average every second spin too, and 4 reels of Wilds aren't rare in these spins although the full screen of Wilds is the best hit possible at 500x bet.